I am not the type of person who needs a shower upon waking in order to get my day started. In fact, it would have been tough when I worked on a dairy farm and rolled out of bed, pulled on my boots, and was in the barn before achieving full consciousness. This means that I shower at weird times. 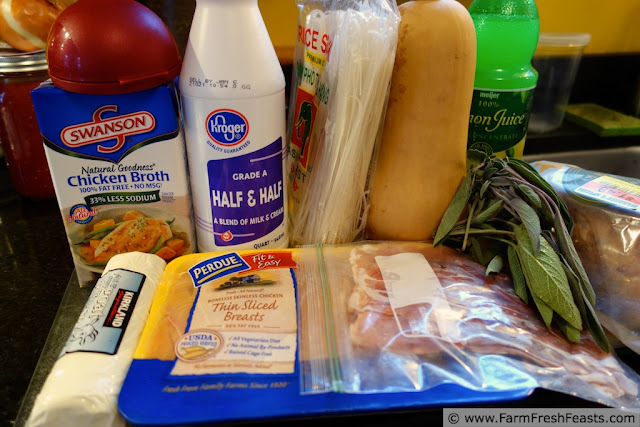 (Why am I talking about my shower habits on a food blog?) Lemme 'splain. I think pretty well in the shower. The idea for this recipe came during a late weekend afternoon shower. I'd already cooked the sweet potatoes for the hash and decided to shower while they were cooling. I was pondering the rest of the Strategic Winter Squash Reserve. It came to me--in between the first and second time I washed my face--why not shred a butternut squash? Why not stick that shredded squash onto a thin piece of chicken, roll it up, and cover it with a sauce? (I think I ended up washing my face twice because I was distracted debating between grapes and band fundraiser oranges for the sauce). Then I got out of the shower, dried off etc, and got on my computer. First, I found this, followed by this. Then I found this. Then this. And finally this. Thanks to a comment from Annemarie of Real Food Real Deals, I decided to try rice noodles with this dish. Depending on the type of chicken broth you use, this recipe could be gluten free. Despite my utter inability to make it look as easy as in the videos, it was pretty quick to assemble, cooked fast, and tasted great. I think it would work well for both an impressive Valentine's day meal or a tasty family supper. And then stay tuned, because I've been busy stuffing shredded butternut squash into muffins and pizza! I never used the onion or half and half. Why are they here? Photo crashers. Lay out the chicken breasts on a cutting board and sprinkle with salt and pepper. 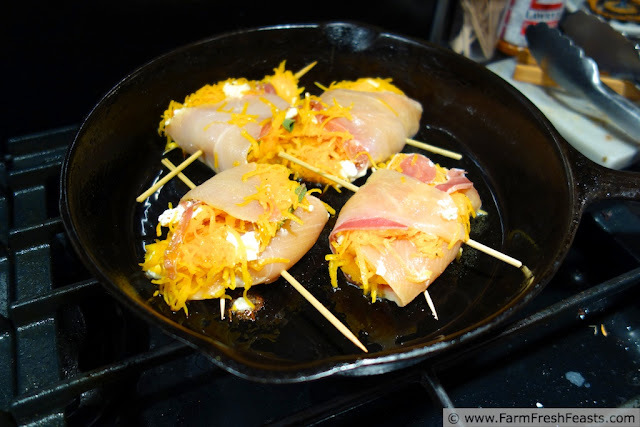 Top each breast with a thin slice of prosciutto, a generous tablespoon of goat cheese, a couple of leaves of fresh sage, and 1/4 cup of shredded butternut squash. Roll up as in the photo. Realize your toothpicks are too puny. Holler for your son to fetch the giant bamboo skewers since your hands are all . . . raw chickeny. Stab the rolls vertically with the bamboo skewer, realize that's not a good long term solution for actual cooking, and re-stab in a horizontal way. Add the puny toothpicks on vertical angles to help hold the roll together. Preheat a large skillet over medium-high heat. 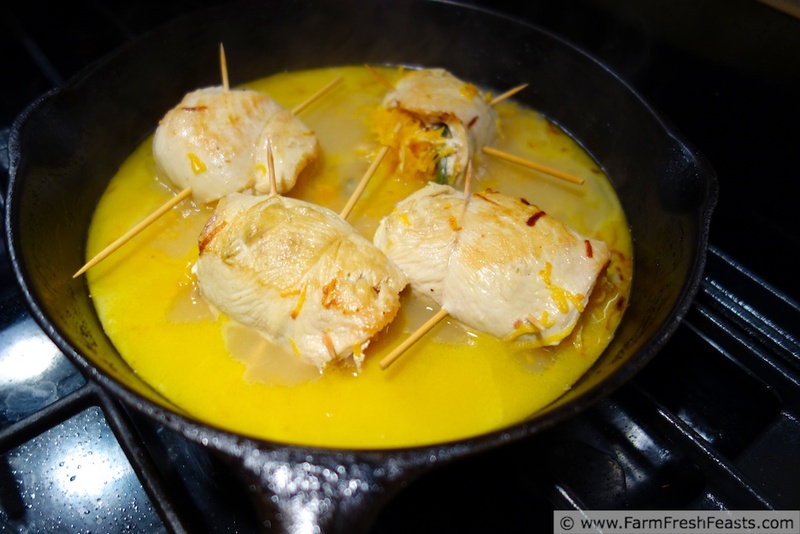 Realize the skewers are way too big to fit 4 chicken rolls in your skillet. Grab your handy dandy kitchen shears and chop off the ends of the kitchen shears so that everything fits in your skillet. Brown the chicken for about 2-3 minutes, then carefully flip to the other side. Brown another 2 minutes, then add chicken stock and lemon juice. Cover and simmer 10 minutes until chicken is fully cooked. While chicken is cooking, pour boiling water over rice noodles in a bowl and set aside. When you're ready to serve, remove chicken to each plate. Crank up the heat to high and reduce the sauce, while your daughter removes all the various skewers. 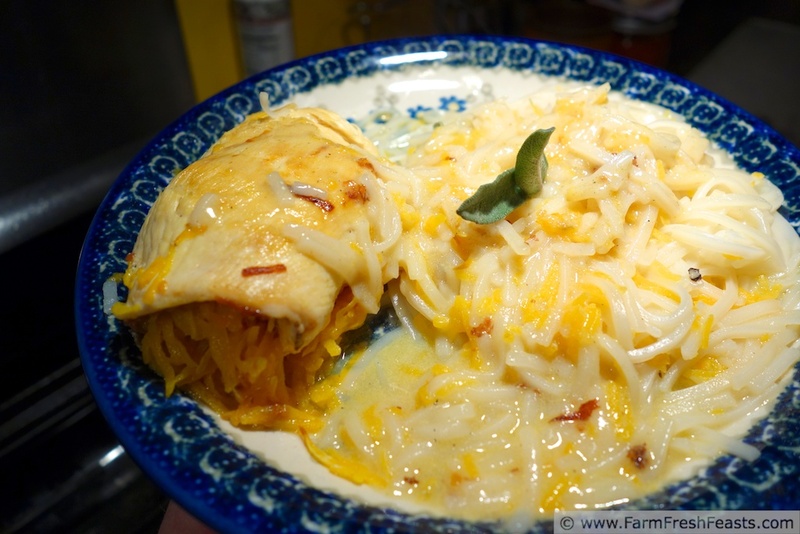 When the liquid has reduced, a few minutes later, drain the rice noodles and toss them in the skillet with the sauce. Add the noodles to the plates and pour any remaining sauce over top the chicken. This post is playing with the rest of the food at the Wednesday Fresh Foods Link Up at Gastronomical Sovereignty, What's Cookin' Wednesday at Buns In My Oven, the Farm Girl Friday Blog Fest at Let This Mind Be In You, Laura at Sprint 2 The Table's Strange But Good, Food on Friday (twice) and What's In The Box by In Her Chucks. Check 'em out! I don't usually get very elaborate, but apparently this was hidden in my somewhere. Who knew? Your pancakes look so tasty! I'm drooling right now thinking of them. 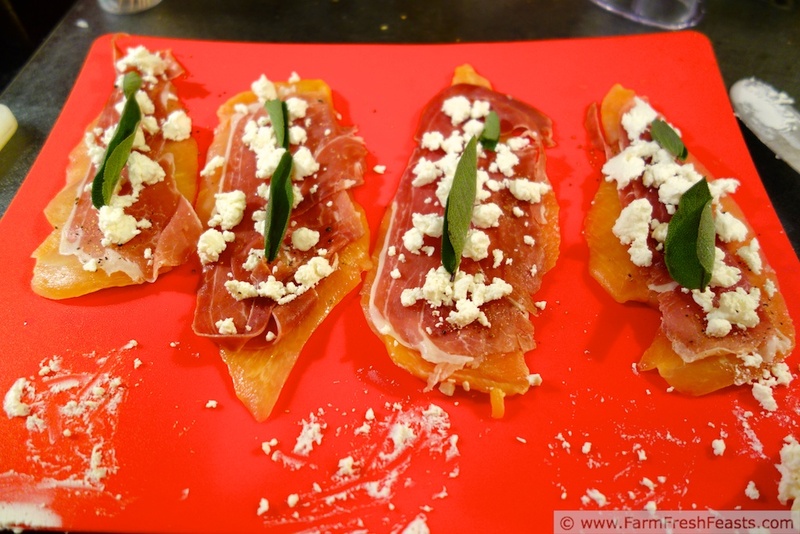 The butternut squash/prosciutto/goat cheese combo sounds really tasty. And it looks pretty, which is always a plus! So, between this post and all your fabulous pizzas, you inspired me to make a butternut squash, goat cheese and proscuitto pizza. It was great - and I gave you a shout out in my post. Thanks so much!!! Awesome job--and on a work day/week night to boot! I'm impressed. I hope you got my FB thoughts yesterday. I saw your photo on FB and your dinner looked amazing--great job in your new little kitchen! Thanks so much for putting that idea in my brain! I'm way impressed. This looks beautiful, and I love the sprig of fresh sage tucked into each breast. 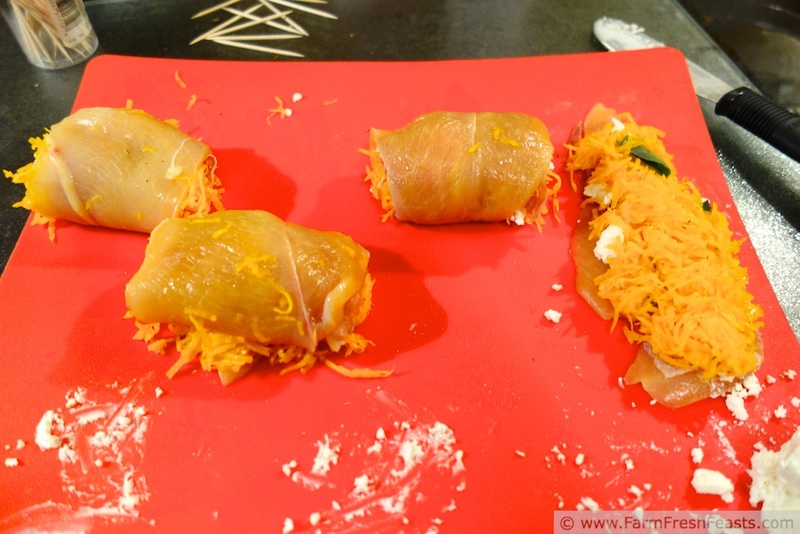 I can't wait to see what else you concoct with the shredded squash. Thanks, Meghan! You would have been impressed, or perhaps not, with the stream of curses running through my brain as I was trying to stab the skewers through the damn breasts. It ended up working out in the end, thanks to the minions. It's funny because I think that way in the shower too! I come with all kinds of stuff to cook when I'm in the shower, lol. 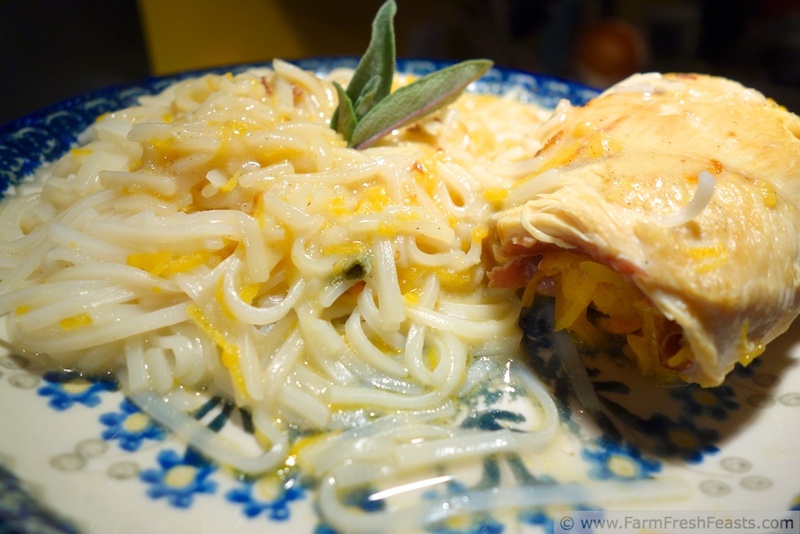 Chicken saltimbocca was one of my favorite meals to eat at my parent's restaurant years ago. I LOVED it. I think I made it at home many years ago when my husband and I were just dating, I have got to try it again. This looks so delicious! Do you remember it when you're out of the shower? I'm starting to think I should design a 'write notes in the shower' device and market it to food bloggers since so many of us think there. OMG you never cease to amaze! this sounds awesome. If only you could move back here and cook for me! if only i had more time and my boss "who shall not be named since you know him" does not make me stay so long at work!! :) i am quitting work and and PTA so i can make this!! yes! or realistically will wait til Saturday to try it. thanks for sharing as always! I only wish I could cook for you . . . but I cannot decide where I want to move to next. Luckily that decision is not to be made for at least a year. Or so I think as of this writing! This looks really good. I never heard of chicken saltimbocca before. I look forward to giving it a try! I hope mine turns out as pretty as yours. I added you to my list of favorite blogs/websites! I'd heard the name but never connected it to chicken with prosciutto and sage until I started googling and found those links I posted. It's so hard to take photos on my stove top at night, but my family isn't ready to be fed during the best lighting time so I have to make do. Thanks! I'm off to check out your blogs! This dish looks fantastic - what a delicious meal, especially with the goat cheese! And I shower/bathe at weird times, too, HA! Working from home gives you good flexibility like that. =) And I think great in the bath/shower, too - it's where many of my best cooking ideas come to me! I'm telling you, there could be a whole line of 'in shower accessories for food bloggers', like I mentioned to Aggie above. Note boards, perhaps a voice recorder . . . I love this idea! I eat grated butternut raw, but never thought to stuffit in chicken. And that proscuitto... mmmm! Thanks so much for linking up to Strange But Good! You know it never occurred to me to eat it raw--the possibilities this thought opens up are slightly staggering, and I am glad I am sitting down. Wow, that looks really yummy! All that cheeeeeese! I love cheese! I appreciate you taking over the Farm Girl Blog Fest (I almost typed the Farm Gorilla . . what's up with that??) as I see such amazing posts there. Thanks! lookin good sister sue! i do my best thinking in the shower too... of course, i don't have a pen and paper to scrawl down the idea ever then. i need a waterproof white board. haha. love the chicken!! When you partner with Williams Sonoma to make the line of Food Blogger Shower Accessories I will be happy to be a beta tester. YUM! I love all these flavors and I can't wait to try it! Thanks for stopping by my blog today. I hope I can continue to make you laugh & you can continue to inspire my meals! I'm still laughing--you're a hoot! That is some gorgeous chicken! I need to figure out how to cook for the family during daylight hours so I can take better photos, and aspire to have photos like yours. Foolish family wants to eat when it's dark out. Guess I know what I am doing with my next butternut squash! I can't believe I never thought about grating it and using it as stuffing. Genius! I can't tell you what was in the shampoo to give me that light bulb moment in the shower, but I'm glad of it. It's a fun new way to look at an oft-looked over vegetable.